Both rock and water were old-established garden features before anyone dreamt of having lawns, beds or borders. Thousands of years ago the first Japanese garden was nothing more than an expanse of white stone chippings with a single Cieyera tree at the centre, and rhe Ancient Persian 'paradise' had a long canal and fountains at its heart. The attraction is easy to understand — these two elements bring a natural feel to the surroundings. Until fairly recently, however, they were primarily the preserve of the wealthy. Before the latter pan of the 19th century rocks were used to create bold structures in large estates and it was not until the middle of the 20th century that pond and fountain construction became simple and economical enough for the ordinary gardener. It has taken a long time, but both rock and water gardening have at last come of age. There is now enormous popular interest in all aspects of the water garden, and rock garden plants are grown in great numbers and variety these days in both rockeries and rock-free situations. It is interesting that both these natural elements have several features in common. 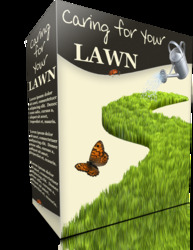 They can extend for a few square feet or more than a quarter of an acre, and both provide the opportunity to grow a range of plants not found in the ordinary garden. The drawbacks they share are that careful planning and preparation are required and an appreciable amount of labour and money is necessary for their creation. 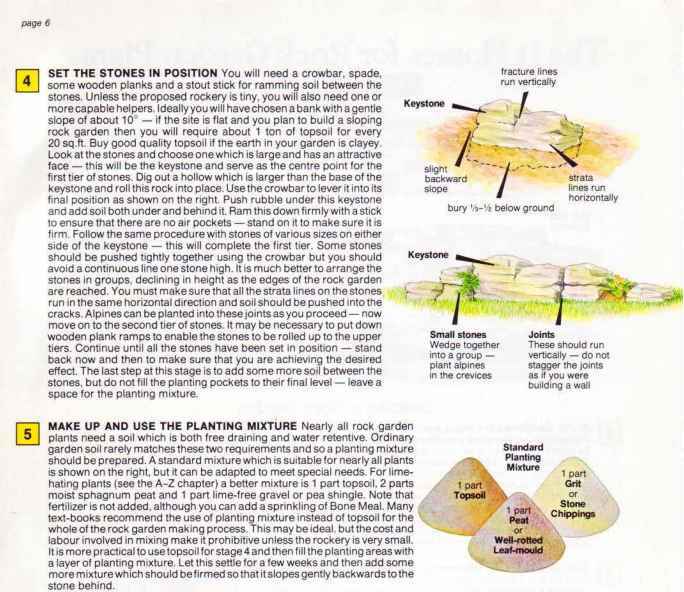 The purpose of this book is to introduce the world of rock and water gardening to the ordinary gardener rather than to serve as a textbook for the experienced specialist. 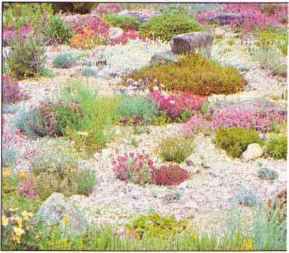 The first section is devoted to the use of rock garden plants, popularly referred to as 'alpines'. There have been three periods in the history of the rock garden and its place in Britain. This history has been surprisingly short. The first period was a time to show off the rocks and the term Rockwork is used in this book to describe such a structure. It began in the middle of the 18th century with the building of the first grottoes, and then in Victorian times there was the grouping of massive rocks in some of our Grand Gardens. The giant millstone grit boulders at Chatsworth are an outstanding example. Apart from some ferns and evergreens there was little planting amongst these stones. By the latter part of the 19th centrny the age of the large rockwork was over. In 1772 the second period of this history began — a garden of rubble and Icelandic basaltic lava was created in a greenhouse at Chelsea Physic Garden for the cultivation of plants collected from the Swiss Alps, Here the rocks were used as a home for plants rather than to provide just an ornamental feature, and the term Rock Garden is used in this book to describe such a structure. This second period got off to a slow start, although rock gardens were created at various sites in Britain and the idea of laying stones to give the appearance of a natural outcrop was developed. Things changed in the 1860s and the rock garden at last took its place as an important part of the British garden. 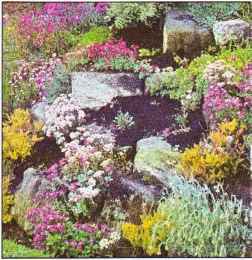 Rockeries were built at Kew in 1867 and in Edinburgh in 18/1, and in 18/0 V\ illiam Robinson's Alpine Flowers for English Gardens was published. During this period and into the early 20th century Pulhamite 'Stone' was manufactured in Broxboume in Hertfordshire and used to create public and private rock gardens throughout the countiy. During the 1920s and 1930s the idea of growing alpines in non-rock situations tookroot, and this coupled with the appearance of the garden centre in the second half of the 20th century brought about the third period in this history. 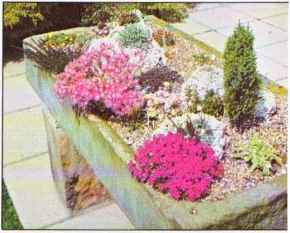 People began to see the full range of plants which was available and all sorts of easy and inexpensive ways appeared for cultivating alpines without having to build a rockery. So interest switched to the plants and away from rock structures, and this is the key feature of this third period in the history of rock gardening. 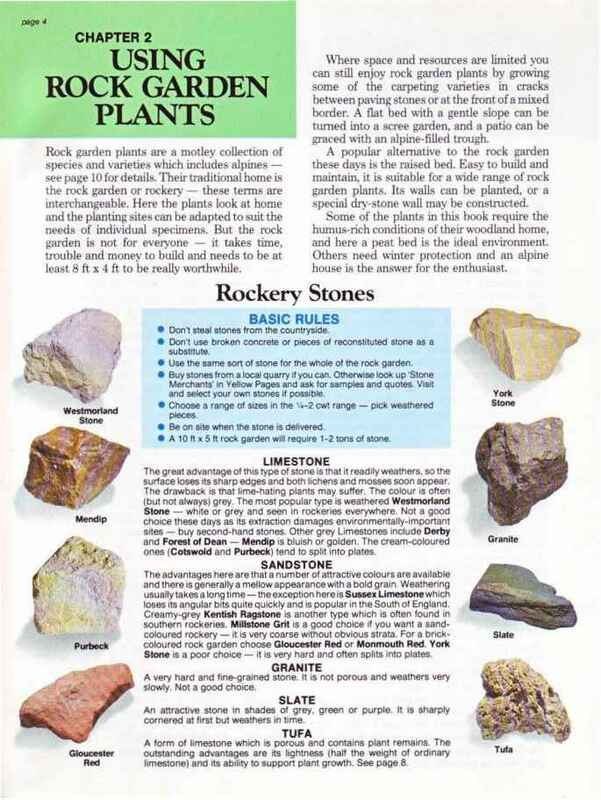 The term Rock Garden Plants is used in this book to describe the species and varieties involved. PLANT AND MULCH Some garden designers insist that thefront of the rock garden should be planted with large specimens and the lowlier ones should beset at the back in order togive an impression of maximum depth. It is better to go for maximum interest — use some bold plants such as dwarf conifers and shrubs as slnglespecimen plants here and there and grow smaller plants In groups in the spaces between. Aim to cover some but not all the rock f3ces with carpeting plants and also aim for year-round-colour. Never plant without checking the A-Z guide first — look at the plant's spread and its light/soil type needs. Do not plant rampant growers next to choice and delicate varieties. Plant lime-hating types at the top of the rockery if limestone rocks or chippings have been used In its construction. With pot-grown specimens you can plant at any time of the year if the ground is reasonably moist and not frozen. The experts prefer spring in cold areas and mid-autumn elsewhere. Water the pot and let it drain before removing the plant — loosen the roots. 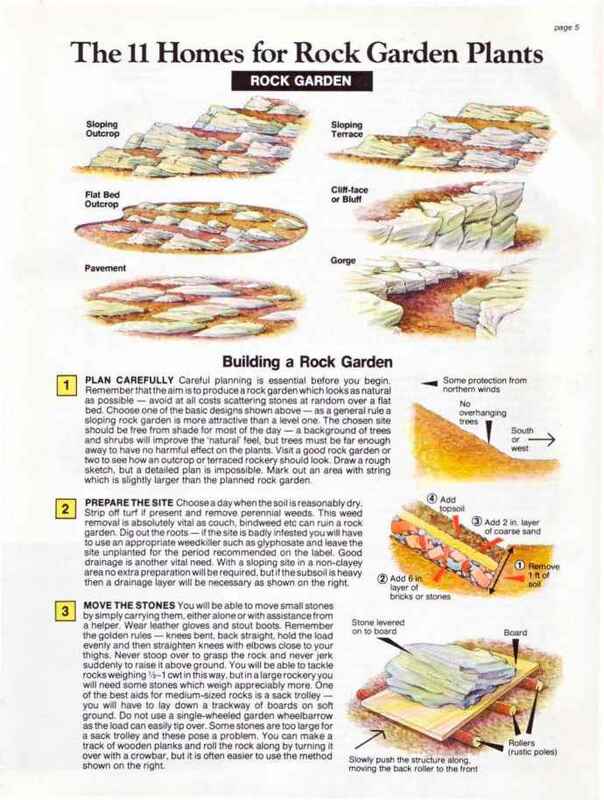 Planting in crevices should take place during construction — rooted cuttings are best but you can use pot-grown specimens if the root bail is trimmed to fit. Terraces and pockets between the stones should not be planted for a few weeks after the rock garden has been built Dig a hole which is larger than the root ball and fill the hole with water. When this has drained away put in the root ball and fill the space around it with planting mixture. 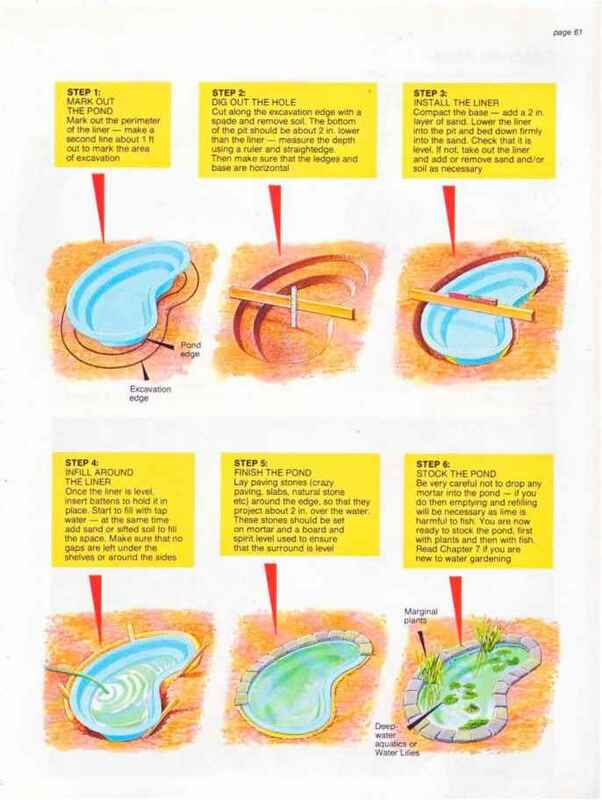 Firm the mixture with your fingers and water in. The final step is to cover the surface withal in. layer of grit — % in. pea gravel can be used but the best choice is small chippings of the stone used in the construction of the rock garden. 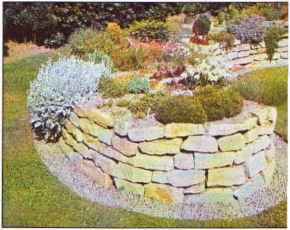 How to make a rockery garden?